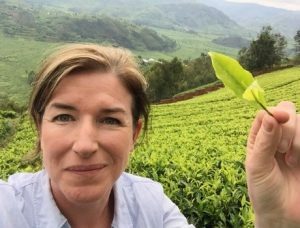 Anne Irwin, Co-founder and Managing Director of Suki Tea, started the Belfast-based, artisan, loose leaf tea business, with business partner, Oscar Woolley, in St. George’s market in 2005. Anne is primarily responsible for sustainable strategic planning, and manages all sourcing, nurturing of supply chain relationships as well as product quality and integrity. The company are proud to champion Fairtrade, Organic and Rainforest Alliance certified tea and promote marketplace leadership in its stance to operate sustainably and responsibly for their TEAm, and growing global community of honest, loose leaf tea lovers. The award-winning company is now a renowned brand throughout the UK and Ireland in both foodservice and online, not only for its great-tasting, quality teas, but also its leading stance on doing business the right way.